The following is the complete text of the statement published on the homepage of the US embassy in Kyiv, with my comments in italics. Original text here. The SA-11 designation corresponds to the versions 9K37 Buk and 9K37M Buk-M1. Note the difference in wording: the US have “detected” the vehicles coming into Ukraine, meaning that they have observed this happening (likely either by satellite, UAV, or boots on the ground). However, they have only “information indicating” the presence of a training facility where air defence systems are taught, signaling a lower degree of certainty. The specific mention of anti-air training given by the Russians to separatists adds credibility to the charges that the Buk-M1 is indeed Russian supplied (and possibly crewed), as opposed to stemming from captured Ukrainian stocks. This is not necessarily relevant. As far as I know, one single transport has been downed at height, the other aircraft and helicopters all having been shot down at low altitude and/or during take-off or landing. The single Antonov An-26 is the sole plane shot down at a height which rules out the use of MANPADS, and it is better described as a medium-sized transport. This is the core evidence of the statement. The US has detected the launch of a missile from separatist-controlled area happening at the same time the MH17 was downed. It is unclear what kind of intelligence indicates (note the word “believe”) that it indeed was a Buk, but it is still a very strong piece of evidence. Having perhaps the world’s best intelligence network, and then using easily faked videos of separatist communications posted on YouTube as evidence sure has a degree of ridicule attached to it, but is also an inidcation that US intelligence believes at least some of these transcripts are real. See the earlier post where I discuss some of the OSINT evidence available. Yet another indication that the US is closely monitoring the Ukrainian crises, probably through the use of recce satellites as well as SBIRS. This raises questions about what kind of intelligence the US has on the claimed use of BM-21 Grad MLRS by both the separatists, Ukrainian armed forces, and from Russian territory, as well as the alleged civilian targets these were used against. This is nothing new, but has been openly available since the day of the downing. Compared to the brief mentioning of YouTube-videos above, here it is explicitly said that the Intelligence Community have evaluated the videos, and believes these are real. The video is found on my earlier post. Note that in this statement the location of Krasnodon is not doubted, but seen as confirmed. This comes as no surprise for anyone. In itself, it is not evidence of the missile stemming from separatist held territory, the missile has a range of roughly 30-35 km, and the plane didn’t not fall straight down when hit. However, taken into consideration with the other evidence presented here, it does strengthen the case against the Russian-backed separatists. In conclusion: The US authorities seem sure that the missile was launched by the separatists, but so far lacks hard proof that they were trained in Russia, or that the crew would indeed have been made up of Russian regulars or volunteers. The shooting down of Malaysian Airline’s MH17 turned yet another page in the Ukrainian crisis. To begin with, I want to assure that although this text will focus on the technical side of the shoot-down, my heartfelt sympathies are with the next of kin of those onboard the flight. To shoot down an airliner flying at its cruise altitude, in this case somewhere around 33 000 feet (~10 060 meters), requires at the very least a medium-ranged surface to air missile system, with some kind of radar for target data. There has been much use of the word “advanced” in reference to these systems, but this is somewhat misleading. Already the crude “flying telephone poles” of the S-75 Dvina (SA-2 Guideline) had a high enough ceiling to be able to down Gary Power’s U-2 in the famous incident in 1960. A quite large number of different systems could be used to down an airliner flying straight and level in a low-noise environment. However, what they all share in common, is the fact that an untrained person (or, rather “persons”, as these usually aren’t crewed by a single operator) will not be able to get a missile of, let alone actually hit anything. Note that “untrained” is a relative word. As James Mashiri notes, to be able to fire at a “soft” target the operator needs relatively little training (a few hours of seeing the system in action and getting some answers to the “why did you push that button?”-type of questions). 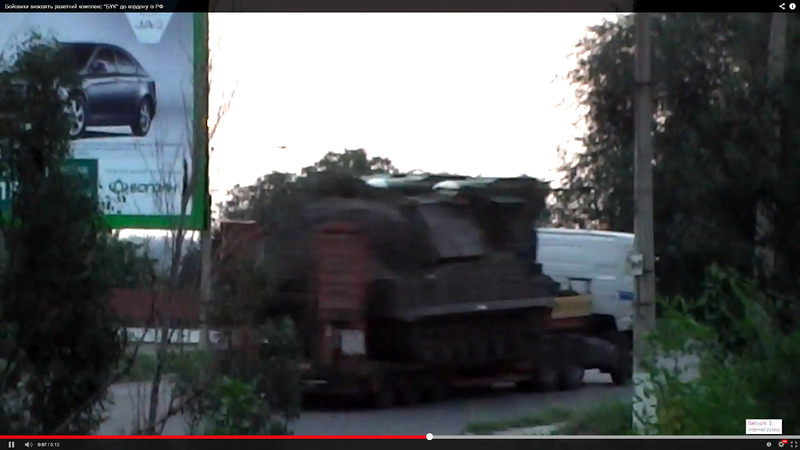 The prime suspect in this case is the Soviet-made Buk-system. This was created as a successor to the earlier 2K12 Kub (SA-6 Gainful), which had proved to be a serious threat to aircrafts operating at high and medium altitude during the Yom Kippur War of 1973. What was noteworthy with the Kub compared to the earlier S-125 Neva (SA-3 Goa) in that it was carried on a tracked transporter erector launcher (TEL), giving it the ability to rapidly change firing positions, making it harder to destroy. Still, the weak link was that the launchers relied on the 1S91 radar vehicle accompanying each battery, meaning that if the radar was taken out or malfunctioned, the whole battery went blind. To solve this issue, the 9K37 Buk (SA-11 Gadfly) was normally mounted on a TELAR, which not only transported and fired the missiles, but also held a 9S35/9S35M1 (Fire Dome) tracking and engagement radar. The radar is not meant for acquiring targets, notably it lacks the 360o field needed to do this properly, but gives the launcher a degree of autonomy in the event that the 9S18/9S18M1 (Tube Arm/Snow Drift) target acquisition radar of the Buk battery is knocked out. The Buk is a widespread system, being found both as regular exports and in a number of former Soviet states. The 9K37M Buk-M1 is also found in Finnish service as the ItO 96, but is expected to be phased out in the near future. Another noted user is the Georgian armed forces, which used the Buk-M1 to down a single Tu-22M and possibly up to three Su-25 during the 2008 war. The Ukrainian armed forces operate at least the M1-version, but it is unclear to me what other versions might be in their arsenal. A number of pictures and videos have surfaced, purportedly shot in the area of the downing of MH17. A reminder is needed: the conflict in Ukraine has seen both purely photoshopped pictures, pictures from e.g. Syria, and pictures taken out of context, which allegedly show different events which might or might not have happened at all. This video claims to show the downing of the Ukrainian air force An-26 that took place on July the 14th prior to the downing of MH17. It has also been claimed to show the downing of MH17, which is false, as the plane in the video isn’t a Boeing 777. It obviously might be from somewhere else, but the language and vegetation fits Ukraine this time of the year. The downing of the Antonov is not contested, and was admitted by both the separatists and the Ukrainian government as it happened. Of interest is the fact that according to the Ukrainian government the plane was flying at 6 500 meters (21 300 feet), meaning it was outside the target envelope of handheld systems like the 9K38/9K338 Igla/Igla-S (SA-18 Grouse/SA-24 Grinch). If the stated altitude is correct, this in itself proves the existence of a medium-altitude system in the area around Krasnodon in the middle of July. The crash sites of the two aircraft are separated by a roughly 150 km long trip by road from each other. As a side-note: it is open to speculation why the airspace above 32 000 feet was deemed safe on July the 17th, as the Antonov proved that 21 000 feet wasn’t. I for one can’t come up with a system with a ceiling between these two values. On his blog Cornucopia?, Lars Wilderäng has listed a few pictures and videos claimed to show the movement of a single 9A310M1 Buk-M1 TELAR along Ukrainian roads in the area. The two most interesting are found here and here. Both seems to be authentic, and fits the description of the situation. A video that surfaced after the downing of the plane shows a single TELAR (the same?) being transported by a civilian truck. Note the fact that only two out of the normal load of four missiles are visible, and that using white civilian trucks to transport (unmarked?) TELAR’s is not standard operating procedure (at least not in Finland). A still frame from the video is shown below. All in all, there seems to be enough evidence to indicate the existence of a single 9A310M1 Buk-M1 TELAR in the area of the crash site of MH17. If the TELAR operated independently, target acquisition would have been somewhat problematic. As said, the system has a limited capability in this field. However, using the radar requires fuel for the gas turbine as well as emitting radiation which can be picked up by Ukrainian ELINT-planes. Another possibility is that the target was first picked up visually by a spotter (in the crudest version by a crew member standing outside the TELAR), who relayed an approximate position to the operators. These then proceeded to shoot down the plane, most probably believing it was a military transport. On the juridical part of this, see James Mashiri’s detailed analysis. Of interest is also the evidence in the case. Although currently most facts seem to indicate it was the separatists who shot down the plane, hard evidence is so far lacking. The US almost immediately pointed finger on the separatists (and Russia). The interesting part is that the US very well could have the proof for these charges, namely by being able to pinpoint the launch site through the satellite based SBIRS and/or by ELINT-measures based in nearby NATO-countries (e.g. planes orbiting over Romania). Here SBIRS seems to be the most likely case, but it is possible the US withholds the form of the evidence as not to show the exact capabilities of one of their major strategic defence systems. The less than proper handling of the crash site by the separatists on the other hand, seems to indicate that they are either covering up something and/or are simply worthless at public relations management.